Lucky Cat owners Greg and Hannah Slamen. Journal photo by Jordan Wald. There’s a cool new kid on the block in Homewood. 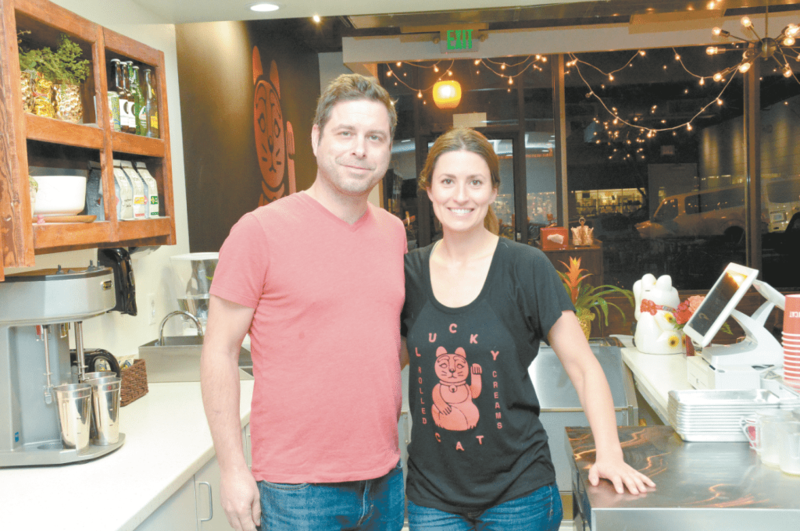 Feb. 3 was the official start date for Lucky Cat Rolled Creams, an ice cream shop at 2908 18th St. South. The store actually opened two weeks before that with a “soft opening” that let owners Hannah and Greg Slamen give their place a test run. Thus, there was little fanfare – but there were plenty of fans. Lucky Cat’s customers aren’t alone in their attraction to rolled ice cream. The frozen dessert that got its start with street vendors in Thailand, Malaysia, Cambodia and the Philippines is getting lots of attention. An article in Food Network Magazine’s March 2018 issue touted the treat’s popularity. The Slamens said their customers seem to like watching the rolled cream being made almost as much as they like eating it. The recipe starts with an ice cream base from Working Cows Dairy in Slocomb. “We add vanilla and salt to the base and pour it directly onto a very cold pan,” Greg said. Next, other ingredients are added to create different flavors. She said the mixture is in the pan about a minute and a half. The rolls are packed into cups so that they stand on end before toppings like candy sprinkles and mini waffle cones are added. This is the Vestavia Hills couple’s first venture into the food business. Hannah is from Sacramento, California, and came to UAB on a synchronized swimming scholar- ship. She later worked in New York as a photography intern. Greg is a Birmingham native who went to Indian Springs School and the Jefferson County International Baccalaureate School. He graduated from Auburn University, got a master’s degree in business administration from UAB and is now IT manager for Big Communications. “As a kid, I worked at different restaurants in Auburn and at Bottega here in Birmingham, and I really wanted to open up a place,” he said. The Slamens were living in Crestwood when they first began talking about starting a new venture. “Looking at the Crestwood Shopping Center with Seasick Records and the park nearby, I thought, ‘You know what would go really well here? Ice cream,’” Greg said. A friend sent them a video of a street vendor in Thailand making rolled ice cream. They bought one of the special pans used to make the ice cream from a company in Hong Kong. The couple practiced and learned before selling their ice cream at pop-up events. The Slamens said giving the ice cream their own twist lets them put their food values into practice. “This allows us to source locally, to be as organic as possible and to have fresh and seasonal ingredients,” Hannah said. On the menu are creations that start with a vanilla base, like the Maja, which has Taza Mexican chocolate, cinnamon and a butter waffle cookie. The Trolley Car has Ghirardelli chocolate and caramel sauce, a brownie and chocolate sticks. The Fairy Tale includes marshmallow fluff, sprinkles, a mini waffle cone and Pocky sticks – chocolate-coated cookie sticks. Maple syrup, bacon pieces, chocolate-dipped bacon and a mini waffle cone make up the Sugar Moon. The Slamens’ two children already have their favorites. “Magdalena’s favorite is Fairy Tale because it turns purple and has gold sprinkles plus a Pocky stick,” Hannah said. “Canon likes vanilla with sprinkles.” Magdalena, age 8, and Canon, 5, are students at Vestavia Hills Elementary East. She said the menu always features some interesting combinations plus simpler choices. The couple said they didn’t think they’d be ready to open a storefront so soon after their first pop-up in their front yard last September. The 18th Street location appealed to them, too. “There’s so much foot traffic here, and we’re close to UAB and Samford University – so we jumped on it,” Hannah said. The store soon will offer treats just for grown-ups. The Slamens hope to share their rolled ice cream in other places. “We’d like to one day open a second place, maybe in Lakeview or in downtown Birmingham,” Hannah said. On one wall of the Homewood store is its namesake: a red cat. Called a “maneki neko” in Asian culture, the lucky cat symbolizes different things according to its color and which paw it’s holding up. The Slamens’ choice seems to be an apt one: The cat in their logo has a raised left paw, which traditionally is supposed to attract customers. Lucky Cat Rolled Creams is at 2809 18th St. South in Homewood. It’s open from 12:30-9 p.m. on Tuesdays, Wednesdays and Thursdays; from 12:30-10 p.m. on Fridays and Saturdays; and from 2-7 p.m. on Sundays. The store is closed on Mondays. For more information, visit luckycatrolledcreams.com or follow the store on Facebook and Instagram.